Infrastructure Leasing & Financial Services (IL&FS) has reportedly defaulted on a short-term loan worth hundreds of crores from Small Industries Development Bank of India (SIDBI). Since this was termed as bad debt or non-performing asset (NPA), SIDBI has reportedly asked one of its senior officials to resign owning responsibility for the default. According to our sources, IL&FS has defaulted in repaying a short-term loan of Rs1,000 crore to SIDBI. At the same time, a subsidiary of IL&FS too has defaulted in repaying loan worth about Rs500 crore to the development financial institution. As an immediate measure, SIDBI has asked Swaminathan Mallikarjun, its chief general manager in the risk management department, to resign for the bad debt from IL&FS. Defaulting on short-term loan commitment that too from an infrastructure development and finance company with pan-India presence, is very serious issue. Nothing of this sort has happened before, our source says. SIDBI's chairman and managing director, Mohammad Mustafa, is from the Indian Administrative Services (IAS) cadre and would like to take strict action in this matter. However, since SIDBI does not really have any security to invoke in its loan to IL&FS and the bankruptcy code as stated in the IBC does not apply to non-banking financial companies (NBFCs), our sources say. We sent a message to Hari Shakaran, vice chairman of IL&FS seeking his comment on these developments. We will update this article as and when we receive response from him. Senior officials from SIDBI were not immediately available for comment. We will update this story as and when we receive their feedback. Separately, ratings agency ICRA has downgraded to 'D' from 'C' bank debt of Rapid Metrorail Gurgaon South Ltd (RMGSL) for not making interest payment for August 2018 on time. RMGSL is a special purpose vehicle (SPV) sponsored by IL&FS Rail Ltd (IRL) with 65.0% stake and IL&FS Transportation Networks Ltd (ITNL) with balance stake. "The revision of RMGSL's rating takes into account the recent irregularities in debt servicing by the company. RMGSL has not paid the interest for the month of August 2018. The company's inability to generate sufficient revenues due to continued weak ridership on the project route had made it highly dependent on timely funding support from promoters. However, the promoter has not made available the required funds. As per the RMGSL's management, the company has represented to Haryana Urban Development Authority (HUDA) for claims due to breach of provisions of the Concession Agreement," ICRA has said. Total cost of the project was funded by a combination of debt of Rs1,500 crore and equity. The entire term loan of Rs1,500 crore has been sanctioned by a consortium of five banks with Canara Bank as the lead bank and an external commercial borrowing (ECB) loan lender. The project achieved commercial operations on 31 March 2017. A single account opened in United Bank of India, under the Pradhan Mantri Jan Dhan Yojana (PMJDY), or the ‘no frills’ or Basic Savings Bank Deposit Account (BSBDA) had a whopping Rs93.82 crore deposited. This was revealed in a Right to Information (RTI) query. Remember, the Jan Dhan account was meant for financial inclusion of the unbanked and is even below the category of regular, basic savings accounts of banks. While Rs93.82 crore is a mind-boggling deposit, other large deposits in nationalised banks are also so large as to raise questions about who these depositors are, what checks were conducted by banks before accepting such deposits and what is the nature of money that has been deposited in Jan Dhan accounts. The Rs93 crore number is so shocking that we wonder whether the Bank undestood the question correctly. However, even ignoring this figure, several banks have reported a very large number for Jan Dhan account which is meant for the poor. As part of a fact-finding exercise, Moneylife filed RTI application with the Department of Financial Services, in Ministry of Finance seeking information on PMJDY scheme relating to Public Sector Banks (PSB). The CPIO of the Department forwarded our RTI application to all banks, asking them to respond us directly. 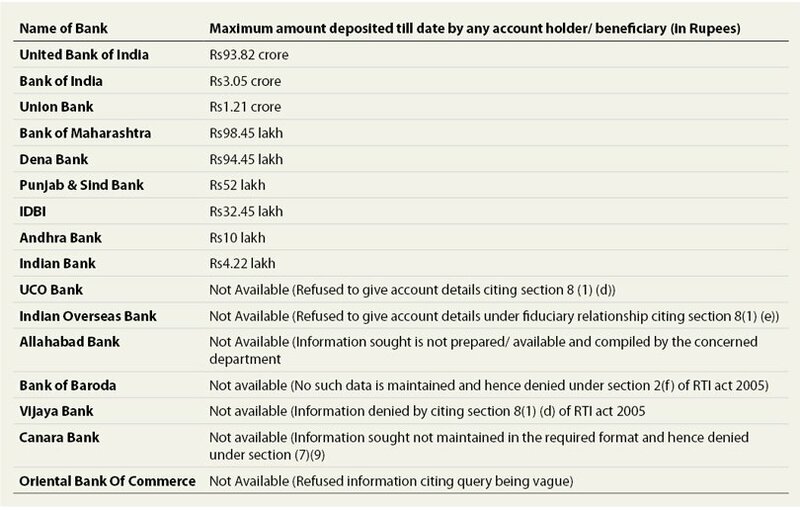 What is the maximum amount deposited till date by any account-holder/beneficiary? The number of accounts having deposit between INR10,000 to INR99,000. The number of accounts having deposit exceeding INR100,000. The number of accounts, which are dormant since past two years. The answers received from several other banks are also startling. While no other deposit was as large as Rs93.82 crore, Bank of India admitted to Rs3.05 crore deposited by a account holder in a Jan Dhan account, Union Bank said it has Rs1.21 crore deposited as the biggest deposit; Bank of Maharashtra had Rs98.45 lakh in one account and Dena Bank admitted to Rs94.45 lakh. Then there was Punjab & Sind Bank with Rs52 lakh in one account, IDBI with Rs32.45 lakh in one account, Andhra Bank with Rs10 lakh in one account and Indian Bank with Rs4.22 lakhs in one Jan Dhan Account. Some nationalised banks have yet to reply to our query and many have found excuses to refuse an answer. UCO Bank, Indian Overseas Bank, Allahabad Bank, Bank of Baroda, Vijaya Bank, Canara Bank and Oriental Bank of Commerce, however, refused to furnish information about maximum amount deposited in PMJDY account. Banks that refused to provide the information have used different excuses like 'information not available', and various sections from the RTI Act, like fiduciary relations (Section 8(1)(e)), information denied (Section 8(1)(d)), information not maintained in required format (Section 7(9)) and so on. Remember, these startling numbers are ONLY from the 20 nationalised banks and do not include similar deposits that may have been made in private banks and cooperative banks. Given that the RBI has only recently admitted that 99.30% of demonetised money had returned to the banking system, it would be worth investigating who these mega-rich individuals were mega-rich individuals who felt the need to deposit large sums in Jan Dhan accounts. Were these cash deposits? Was this money transferred from other accounts? Who were these depositors? None of these queries can be asked under RTI, but the government and its investigation, enforcement and tax departments ought to have been trawling through this information already. Remember, accounts opened under PMJDY are opened with zero balance and do not have all the facilities available to regular accounts which have minimum balance requirements. It makes no sense for anyone to stash even thousands of rupees in such accounts. In fact, since Jan Dhan was a tool for financial inclusion and empowerment, there ought to be a cap on deposits in these accounts. Once a Jan Dhan account has, say over Rs50,000 deposited in it, it ought to be converted into a regular account. Another important fact to note is that Jan Dhan accounts were opened with a simple Aadhar number. Since Aadhar numbers are unverified even by the UIDAI (Unique Identification Development Authority of India) these accounts, in all probability, have not gone through the usual KYC (Know your customer) checks and verifications. According to information available on PMJDY website (maintained by Ministry of Finance) as on 29 August 2018, there were 32.54 crore beneficiaries of the PMJDY scheme. All the accounts opened under PMJDY scheme has deposits of Rs82,039.35 crore, the portal says. Will the RTI revelations now trigger a demand to disclose the real beneficiaries of these PMJDY bank accounts? Our RTI filings have many more startling revelations, which we will place in the public domain shortly. Where is the question of not disclosing the information under relent Section 8(1)(d).Send the respective Chairman to Jail for a day then all the information will come out. Was this account linked with aadhaar? If it was then this is a scam. Also need Enforcement Directorate investigation into the Co-op bank in which top most politician is involved ? Demonetization efforts are failed only because the people who helped the rich, particularly who are having black money, to convert their money on commission basis. During the demonetization period, most of the people particularly house wife of daily, were on the queue in the bank to exchange currency of black-money holders just for a commission or daily wage. Like reforms in Russia by president Mikhail Gorbochov we too need urgently Transparency in all public matters, since a large part of people are accustomed too resorting to corrupt practices in all small and big transactions. In my view NAMO underestimated the capability of Indians when it comes to being dishonest and corrupt. Given that NAMO is a seasoned politician, this wasn't expected from him and this was a strategic blunder. What can any measure do when the almost entire society is corrupt.... politicians, govt officials, bank officials, list is endless.........I know many so called demonetization fans who helped their relatives by depositing Rs. 2.5 lakhs in their own accounts. These are typical service class people who had no black money of their own, were welcoming demonetisation but even they could not resist helping their relatives or friends. Had the society at large decided to not rent their bank accounts to the cash hoarders, this Demo would have become a success but in India corruption is bad only when done by opposition camp. End result of all of this is that our procedures to do anything are getting too complicated, complicated KYC for even small transactions is becoming a norm. I echo your thoughts. Spot on. I think these deposits are from the 2016 note ban period. These facts are known to the gov & various agencies are probing. Many have been caught and converted to "resident tax-payers". A few lakh accounts are under the scanner. So these people will not go scot-free. Demonetisation has not removed black money and corruption. It has made them come back with a bang, and with greater ease thanks to Rs.2000 notes. If Rs.5000 notes had been introduced, black money and bribing would have had a happier life and longevity. Even if an illiterate person on the streets knows that when Rs.1000 and Rs.500 notes were accused of black money, no sane government would have introduced Rs.2000 notes. Right from the beginning, the impromptu decision of Mr Modi about note-ban was a fraud on the public at a huge cost! Horrible. This has happened due to implementation without preparation, consultation and craziness to insert the element of MasterStroke. I think what MMS has said about the decision will prove correct. Remember the era the way banks forced to opened accounts under PMJDY and relaxation in KYC norms. I am well aware as I was engaged with a client bank on behalf of FIS during this period. It is nothing but huge scam to convert from black to white, demolishing the liquidity of opposition parties, help cronies by damaging small business, benefit to logistic carriers for currency notes , ATM handling companies by payment of calibration expenses etc etc. Each and every word of MMS is going to be prove. Let deaf and dumb remain in denial and clapping as they don't have abilities to think with open mind. Let's hope for the best for common citizens which required to pay the price silently or otherwise. This is the reasons why they wants to keep common people busy in non issues through godi media and cheer leaders. I was visiting India at the time of the demonetization fracas. I heard from several individuals that they had known their relatives or friends who were bank staff to have connived to accept large deposits in exchange for a consideration. There is no way that this kind of gross misuse of Jan Dhan accounts can happen without the culpability of the bank staff. It should be fairly simple to determine which staff member took the questionable deposit and put her/him in prison. The concerned individual will immediately implicate all others who participated in the transaction. The main question is does the govt/bank want to find out who the culprits are? Very true. Many unscrupulous bankers made money through this saga. They helped not only businessmen but their masters in top management too benefited. Just check how many employees booked? It was an occasional of huge opportunity for the particular section of the society and employess as a part of the implementation process. Don't forget Indian currency lying in Nepal & Bhutan. Why old notes still being sized? Whether government had open its mouth on status of old currency in Nepal or Bhutan. Still that root being exploted. Bank Officials do not know what Jan Dhan accounts are. These are irresponsible officials and should be sent through training once again. If they repeat the mistakes, they should be sacked. Modi also does not know any subject in depth. At one time we thought he was a great sincere and honest reformer. He is only good at oratory and coining some formulas and catchy phrases. His Finance Minister is an adamant man who never accepts his failures. This will get us no where. To be happy and criticize PM now because living in the time where such things are declaref openly and every one can give their opinion freely. Where were your voice when rampant scandals were carried on for such long time of memoth magnitude for purely personal and political gains? Before blaming and doubting even without giving required time to eliminate the kind of disease being attempted. The man is openly inviting all the wise people to contribute their precious advice directly to him/his office, instead of venting at places to get praise from few over enthusiast s.
Politicians are eager to take credit but loathe to take blame. Modi’s govt has done many good things like the revamping of the bankruptcy regulations. But you must admit that demonetization was a big mistake if you consider the impact on the poor and also on the economy as a whole. People should not be vilified for criticism of bad policies. Dont post foolish comments here. Our voice has always been loud and clear against faulty government policies right from the beginning and even during the previous government. You may want to make the effort to read and be more enlightened. if you get a reply email. I am not talkin of solving problems, the babus under this government do not even reply to emails. State Bank of India (SBI), the country's largest lender has removed pay to Aadhaar functionality from its BHIM SBI Pay app citing regulatory guidelines. However, several banks like Bank of India, Bank of Baroda, and United Bank of India have not yet removed Aadhaar pay functionality from their BHIM UPI apps. In fact, National Payments Corp of India (NPCI), which developed and promotes Unified Payments Interface (UPI) and Bharat Interface for Money application (BHIM), has itself not disabled Aadhaar pay from its 'BHIM Making India Cashless' app. Explaining the new features of BHIM SBI Pay, the lender had stated, "Due to regulatory guidelines pay to Aadhaar functionality has been removed." Earlier in July 2018, NPCI had asked banks to discontinue Aadhaar-based payments through the UPI and Immediate Payment System (IMPS) channels. Pay to Aadhaar is an additional functionality in UPI and IMPS where the payer can transfer funds to the beneficiary using an Aadhaar number. "Aadhaar number is a sensitive information and the revised framework about its usage in the payment landscape is still evolving. With this background, we proposed removal of ‘Pay to Aadhaar’ functionality in both UPI and IMPS before the steering committee (meeting held on 5 July 2018). The proposal of removing the Aadhaar number functionality was approved by the steering committee,” NPCI had said in a circular issued on 17 July 2018. From 31 August 2018, the 'Pay to Aadhaar' function would be removed from both UPI and IMPS. “All member banks should remove this functionality both as remitter and beneficiary. Also, all interfaces currently offering this functionality, such as UPI apps and third-party apps, should remove this option from their respective apps by 31 August 2018,” the circular from NPCI says. 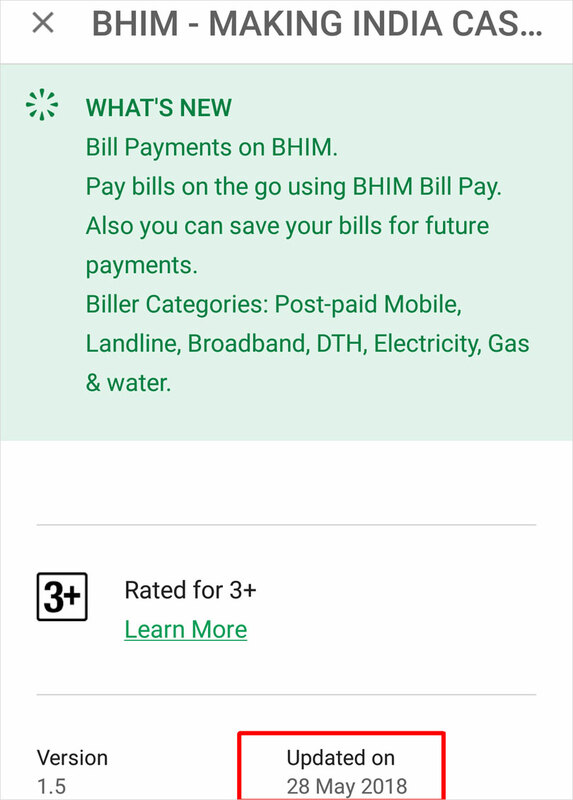 When checked on Google Play, several public sector banks (PSBs) like Bank of India, Bank of Baroda and United Bank of India were still providing Aadhaar pay functionality from their BHIM UPI apps. 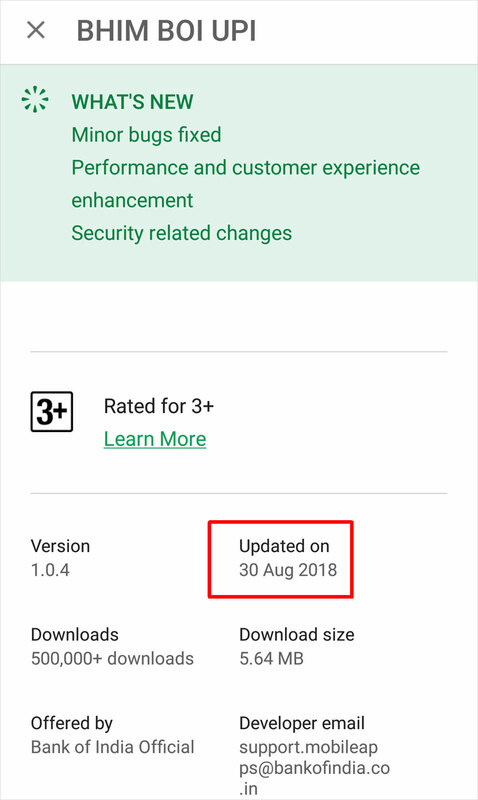 In fact, Bank of India's 'BHIM BOI UPI' app was updated on 30 August 2018, but still offers pay to Aadhaar facility. NPCI also has not bothered to remove pay to Aadhaar from its own app. 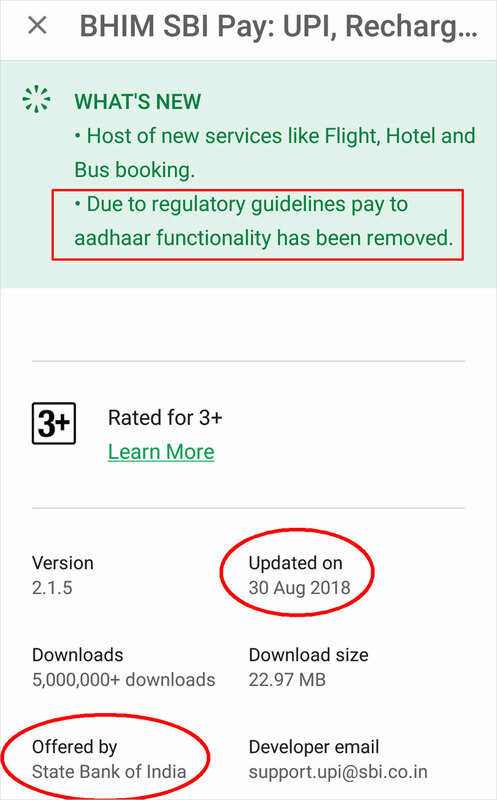 IDFC Bank Ltd, which updated its 'BHIM IDFC Bank UPI' App on 31 August 2018, also has not mentioned anything about removing Aadhaar pay functionality. On the other hand, 'iMobile' app by ICICI Bank Ltd only talks about payments through UPI. It does not mention Aadhaar anywhere in its app. Last year, NPCI, which is set up as a Section 25 company under the Companies Act 1956 (now Section 8 of Companies Act 2013), and is seen promoting its UPI- based BHIM app, had clarified that it should not held responsible for any loss, claim or damage suffered by the user. In its terms and conditions for use of the BHIM UPI app, the company, promoted by 10 banks, had stated, "NPCI does not hold out any warranty and makes no representation about the quality of the UPI services or BHIM application. The user agrees and acknowledges that NPCI shall not be liable and shall in no way be held responsible for any damages whatsoever whether such damages are direct, indirect, incidental or consequential and irrespective of whether any claim is based on loss of revenue, interruption of business, transaction carried out by the user, information provided or disclosed by issuer bank regarding user’s account(s) or any loss of any character or nature whatsoever and whether sustained by the User or by any other person." An Aadhaar number becomes a financial address when an Aadhaar is 'seeded' into a table called the 'NPCI mapper' by anyone linking the Aadhaar to a bank account. This mapper is a directory of Aadhaar numbers and Institution Identification Number (IIN) numbers used for the purpose of routing transactions to the destination banks. The IIN is a unique 6-digit number issued by NPCI to any participating bank. If you, or anyone else, link your Aadhaar with another bank account, the NPCI mapper is overwritten with the new banks’ IIN. Money transferred to an Aadhaar number using the Aadhaar Enabled Payment System (AEPS) gets transferred to the bank account linked to the Aadhaar number at the branch recognised by the IIN. This idea of a mapper, as used by NPCI’s AEPS, does not allow for instructions from sender about the account to deposit money, but relies on periodic update of IIN in the NPCI’s table mapping Aadhaar numbers from banks. This mapping is volatile because multiple banks periodically update the Aadhaar numbers linked with accounts held by them. Neither the banks, the NPCI nor you have control on where you would like your payments to go. According to Dr Anupam Saraph, a renowned expert in governance of complex systems, money launderers exploit this volatility to make money transfers untraceable. "A money launderer can transfer money to an account linked to an alternate IIN and then re-seed the NPCI’s mapper with the original IIN for the Aadhaar number, completely wiping out any trace of money to the alternate IIN. Like transactions of bearer shares in Panama, such money transfers becomes no different from a hawala transaction between real parties who remain anonymous or benami." I am a SBI sb a/c holder. After a long time, SBI enters the leadership shoes and deserves compliments. SBI should have done this long ago. It must have seen the dangers of Aadhaar - based remittances, but it is wrong to expect SBI to have much imagination.